MGM silent. 86 minutes. US release: 9/1/28. 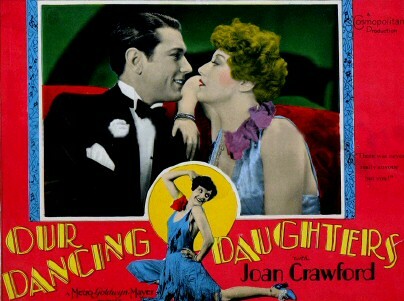 Cast: Joan Crawford (as "Diana Medford," aka "Dangerous Diana"), Johnny Mack Brown, Dorothy Sebastian, Anita Page, Nils Asther, Dorothy Cummings, Huntley Gordon, Evelyn Hall, Sam De Grasse, Edward Nugent, Eddie Quinlan. Credits: Story and scenario: Josephine Lovett. Director: Harry Beaumont. Camera: George Barnes. 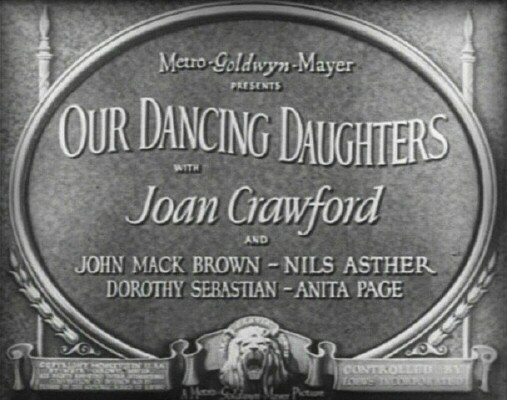 Titles: Marion Ainslee and Ruth Cummings. Editor: William Hamilton. Awards: 1928/29 Academy Award nominations: Best Cinematography (Barnes), Best Writing Achievement (Lovett). 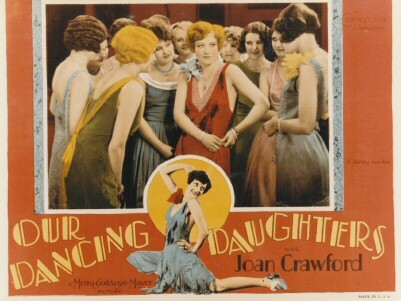 Hundreds of girls and young women were attracted yesterday to the Capitol Theatre and their presence probably was due chiefly to the title of the film feature, "Our Dancing Daughters," a chronicle concerned with the wild young people of this generation. The Capitol now is equipped for the reproduction of sounds, which fact was only too patent yesterday, for while "Our Dancing Daughters" is not furnished with dialogue, it has a musical accompaniment, several love songs, stentorian cheering and, at the end, a chorus of shrieks. Whether this audible mixture adds to the entertainment value of the picture is a matter of opinion. It assuredly detracts from the action of the picture in some of the sequences. The romantic melodies that accompany the love-sick looks and the violent embraces of the principal characters are reminiscent of the oldtime singing to lantern slides. The enthusiastic cheering impresses one as though the producers wanted to make the most of sound, and the shrieks in the closing scenes come from mute figures to whom terror has suddenly given tongues. 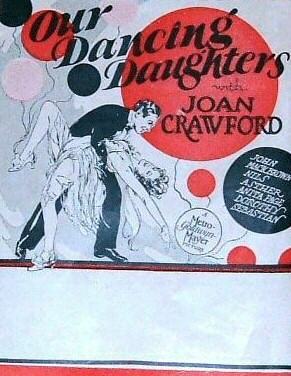 There is nothing startingly novel about "Our Dancing Daughters," for while there is an undeniable vivacity to many of the scenes, the action is not particularly well portrayed and it is frequently anything but conservative. Cocktails, flasks and mad dancing appear in quite a number of episodes. 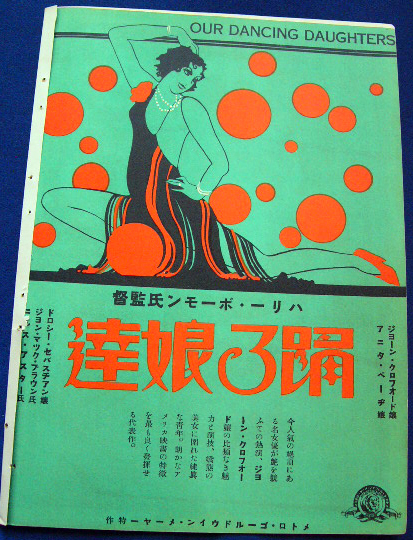 It is quite unnecessary to depict an intoxicated girl, as is done for considerable length in this film. Presumably it is to point a moral, for the young woman falls to her death down a flight of stairs. 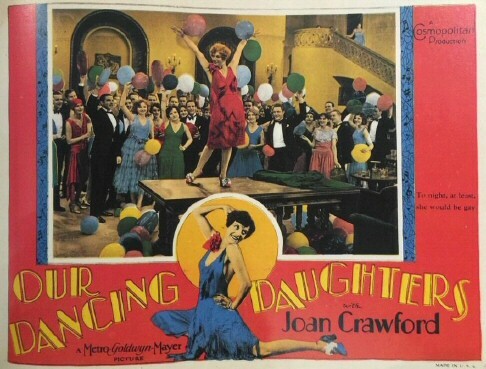 The wide-eyed Joan Crawford, who is attractive in many of the scenes, figures as one of the dancing daughters. 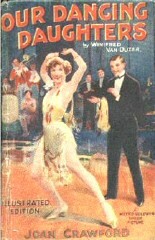 After an unusually violent terpsichorean performance, this young woman, known as Diana, suddenly takes an interest in Ben Blain, a stranger to the hectic life but the son and heir of a multi-millionaire. Harry Beaumont, the director, has among his worthy sequences in this film, one in which the fractious Diana tells her companion, Beatrice, that she is in love. This incident is quite appealing and it caused great glee yesterday afternoon. But Diana is doomed to be disappointed, for a little blonde, the daughter of a mercenary mother, succeeds in capturing the heart of the peculiarly susceptible Mr. Blain. This fair-haired minx, named Anne, soon leads Mr. Blain to the altar and poor Diana is left to brood over a blighted life. Josephine Lovett, who wrote "Our Dancing Daughters," cannot be accused of much subtlety in ridding Mr. Blain of his tempestuous bride. John Mack Brown is sympathetic as Mr. Blain. 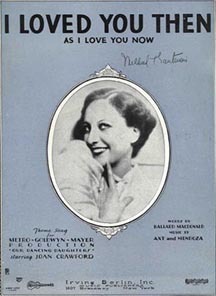 Dorothy Sebastian is appealing as Beatrice. 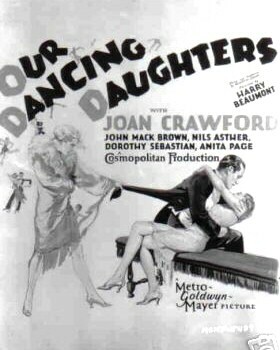 Anita Page gives a fairly good portrayal of her idea of a dancing daughter. Joan Crawford, as the girl who was free and wild but maintained her ideals, does the greatest work of her career. She has a typical Clara Bow role and she gives a lively run around for first honors as a modern flap. Joan has beauty, charm and more refinement than the trim-legged Bow. She makes you believe she's straight even through the torrid, questionable scenes she is required to play. She also shows a snappy Bow figure and she can dance a mean varsity drag. Of Miss Crawford it may be predicted that in case her managers continue to find just such breezy little comedies for her she will realize what apparently has been her ambition for at least two years, and get going as a star in her own right. She has good looks, sprightliness, intelligence and a good sense of humor. She dances with great grace and versatility and she knows when--and how--to call a halt. Gals with gold-digging aspirations can see this and learn. The story depicts life in the younger set and deals with the struggle of two gals for one lad. The presentation of youth is a lovely one, what with a yacht club and cocktails. The main issue is: Will the rich young hero succeed in rectifying the tragic mistake he made by choosing the wrong girl? Light romance - and good. One thrill you won't forget, nor the girl - Anita Page. Hers would be the outstanding performance if Joan Crawford and Dorothy Sebastian were not also in the picture. Nice restraint in the work of John Mack Brown, leading man. Nils Asther's fervent kisses not too good, but his jealousy is real. Eddie Nugent, a prop-boy turned actor, is well started. Pictures are certainly getting better. Don't miss this one if you really want to be entertained. It has practically everything. Youth, pep, good-looking women, attractive clothes, and an awfully good story. The titles are funny. It's all very smart and modern, and Joan Crawford looks and acts better than she ever has. 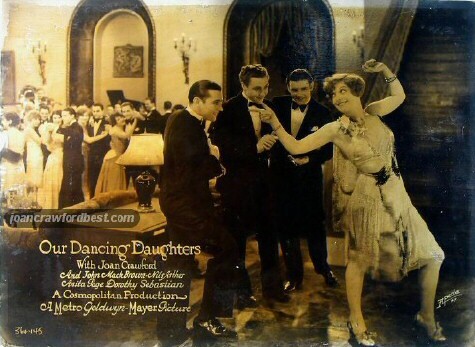 The cast also includes Dorothy Sebastian, Nils Asther, Eddie Nugent, Johnny Mack Brown, and other celebrities. And the big thrill is the small new blonde, Anita Page, who, in her second part, steals the picture from Joan Crawford and gives a performance that would be unusually good even for a big star. The story is about three modern girls, and how they get husbands and how they lose them. 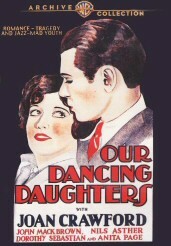 That the public isn't tired of the jazz-mad story is proved in "Our Dancing Daughters," which, while it has nothing of consequence in its plot, succeeds in proving entertaining because of its atmospheric opulence, its colorful incident ­ and the personalities of the players. It has a title with more than its share of magnetism. Consequently, it will appeal to the younger set. What is revealed of plot of has been looked over time and again, but its obvious points will be overlooked in the general excellence of the production ­ and the spirit with which it moves. 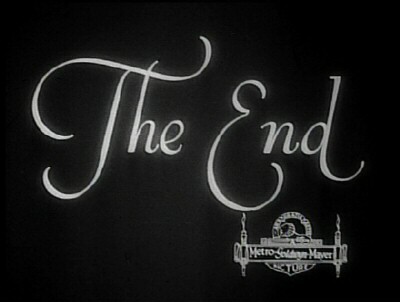 And there's where Joan Crawford steps up and takes a bow. She it is who vies with another girl to win a gilded son of wealth. And there's a lot of animation in those scenes in which she and Anita Page strut their stuff. The picture is beautifully mounted, and the array of shots help in making one forget the plot's shortcomings. It is synchronized in places to bring emphasis to the incident ­ and most of the synchronization is in harmony with the detail it expresses. Nils Asther and John Mack Brown and Edward Nugent carry out the principal masculine assignments and do very well. 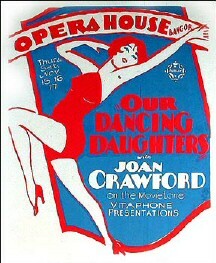 You should like "Our Dancing Daughters" ­ it is fairly hot. 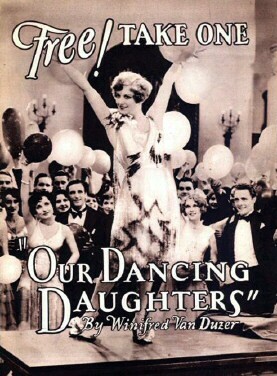 If you've seen Our Dancing Daughters and would like to share your review here, please e-mail me. Include, if you like, a photo of yourself as well as a star-rating (with 5 stars the best), along with any of your favorite lines from the film. 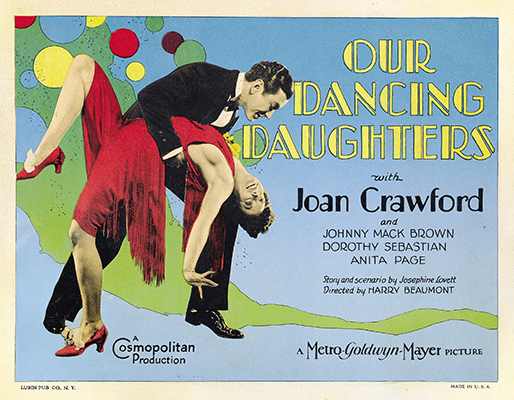 After nearly 4 years of playing, for the most part, a variation of "The Girl" to a host of MGM leading men in various comedies, dramas, even Westerns, 1928's Our Dancing Daughters finally gave Joan Crawford the undivided attention and spotlight she'd been working toward. The movie is snappily energetic, fast and fun and risque. Aside from the above-mentioned scene with Diana sans skirt, there are also plenty of other close-up leg shots, including the opening scene, shot only from the waist down, with Diana simultaneously dancing while pulling on her undies! 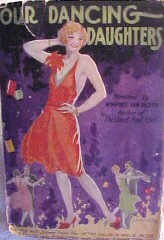 Equally risque are the references to Diana's friend Beatrice's (Dorothy Sebastian) "wanton past"---Beatrice honestly tells her husband-to-be (Nils Asther) that she's been with other men. He's jealous and makes a scene or two, but the fact that this is not a primary plot point and that Beatrice is portrayed sympathetically indicates the "modern," rather enlightened pre-Code place that the picture's coming from. Diana loses Ben to Ann shortly after Ann coos to him: "I can't be daring and free with men. I'm not a 'modern.' I want a husband and babies and to be worthy of them." The heartbroken Diana later cries to her parents: "What's wrong with me? I'm not a liar---a cheat---I've been decent---And I've lost---Why? Men want flattery, trickery---lies!" These issues that the movie raises are interesting and especially timely for 1928 (though still relevant today), when women's roles in society were very much in flux and young women were surely looking for outside indicators of "appropriate" behavior. Sociology aside, Joan's a whirlwind of energy in Daughters, obviously happy to finally have the chance to unleash her own naturally exuberant personality onscreen rather than simply playing the tame good-humored-but-still-proper sidekick to a male lead. But, while her spunkiness is the focus of the early scenes, her later more subtle scenes, when she's quietly mourning or openly distraught over Ben, are equally effective and charismatic. (I did catch her overacting once, but just once!) Joan's co-star Anita Page also gives a standout performance as the smarmy man-stealing Ann; she's silkily smooth when she's making nice and equally good when she reveals her true wicked self in her final drunkenly mocking confrontation scenes. 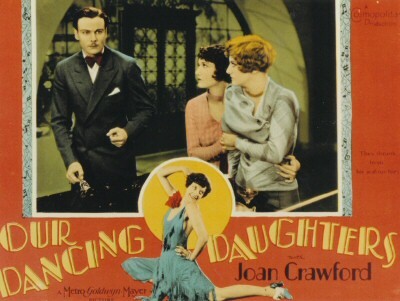 Our Dancing Daughters is a fun watch, and interesting: Historically, knowing how this launched Joan into superstardom, as well as its being honest in its portrayal of sexual dynamics. But also because of Joan's thoroughly modern portrayal of a girl who manages to have a good time while remaining true to herself in the face of public (and her man's) disapproval. I can see why this movie, and Joan, were a big sensation. 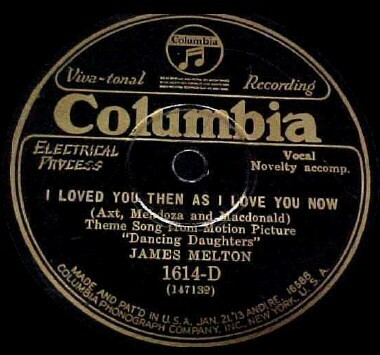 Above: A 78 rpm Columbia record label for "I Loved You Then As I Love You Now," and sheet music for the song. 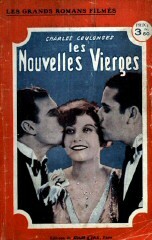 Below: 1928 novelization by Winifred Van Duzer and (right) French novelization by Charles Coulonges. See the Books Related to Joan Movies page for more info.